The speedy and popular heavyweight of dropkick fame was a mainstay of Joint Promotions rings for fifteen years. That's Ajit Singh on the receiving end of both feet in 1962. Francis Sullivan was Christened Alan Latham in Wigan in 1925, the son of Alfred and Martha. He was born into a mining family, his father being a colliery winder, and his grandfather a colliery surface foreman. Like most Wigan lads wrestling was an interest from an early age and Alan would watch the older boys and men wrestle on Ince Common. Wrestling wasn't his only sporting interest, He was, after all, from Wigan, and so rugby played an important part in his life. He could have had a career playing professional rugby but chose wrestling because it was better paid. Alan learned a trade and was working as a Colliery Electrician by the time he married Bessie Aspinall at St Catharine's Church in Scholes, Wigan, on 23rd October, 1948. The couple were blessed with two children, Alan and Karen. In his late teens Alan took up wrestling and started to learn catch style under the tutelage of Billy Riley. Riley impressed on his students that they should learn to wrestle the hard way, learn a trade to fall back on, and that they should be pragmatic in understanding that they went into professional wrestling to earn money. Earning money required not just wrestling knowledge but an understanding of showmanship and entertainment. Billy told Alan, and his own son Ernie, to get along to Matt Moran's fairground wrestling booth. Not only would they earn a bit of extra cash they would also learn the psychology of working a crowd, essential skills for a professional wrestler. Alan and Ernie would travel together to the fair before splitting up with one working as one of Moran's champions and the other planted in the crowd as a local challenger. "Dad said that is why he would get someone in a hold and then jump around with them holding the position because unlike a stage his audience was all around and so he was playing to the ring. He loved to say he was the working girls answer to Rock Hudson." By 1950 Billy decided that Alan was ready for the professional ring and the name Francis Sullivan began appearing on posters around the country. We were surprised,to find appearances in 1950 of a wrestler named Frank Pollard, the earliest being at Colne in January, 1959, opponent Jack Fay and referee Billy Riley. We know that Jack Fay was Alan Latham's friend Ernie Riley. With Pollard later becoming Francis (Sullivan) Pollard and opponents usually Wigan wrestlers, we have our suspicions that Alan Latham was sometimes billed as Frank Pollard (or Francis Sullivan Pollard) on shows at Colne and Derby. Our suspicions, however, cannot be confirmed by members of Alan Latham's family or Riley's protege Roy Wood. The two friends, Alan and Ernie, went into business running a dance hall in Wigan, The Monaco Ballroom, that had previously been shut down due to a rowdy clientele. Alan, Ernie and a few of their wrestling friends soon put paid to any trouble. No one could accuse Francis of being one of those wrestlers who limited himself to working close to home; he travelled the length and breadth of the country. A study of his record shows Francis travelled south to work for Dale Martin Promotions not long after turning professional and was almost a weekly fixture at Belle Vue in 1950. Not just Belle Vue, but a regular at those other big venues Liverpool Stadium and the New St James Hall, Newcastle. 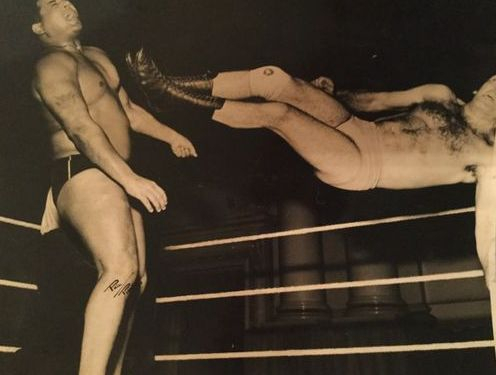 "Francis was my all time favourite wrestler having seen him on TV in the early sixties and then on many occasions at Newcastle where I attended and later worked for a number of years. He was a big favourite among the crowd there, normally pitted against a lot of the top villains of the day although it was against equally skillful wrestles that he most frequently shone; a narrow defeat by Geoff Portz in 1964 was among the top three fights that I have seen. " A report from Worthing in April, 1961 referred to Francis as a "naughty boy," with a "crew cut hair style and ferocious expression." He was said to have provided most of the colour on one of the best wrestling bills seen at the hall. 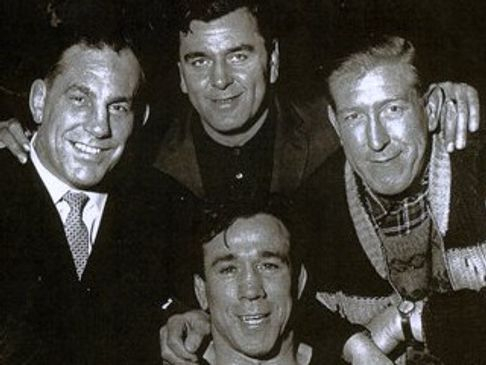 Francis appeared at the Royal Albert Hall in London, with Billy Howes, Iska Khan, Gordon Nelson, Rocco Columbo and John Lees being amongst his opponents. Championship success eluded Francis, though he did give Norman Walsh a run for his money in a British mid heavyweight championship clash. In November 1964 he met Kendo Nagasaki during the masked man's first week in the professional ranks, following in the footsteps of Jim Hussey and Terry O'Neill. "At the end of the match Sullivan was knocked out and when he was revived he started shouting turn on the lights, turn on the lights, in a loud panicking voice, this lasted for a minute or more and I was quite shocked by it, and the wrestling audience were also very concerned. Genuine or just a good act, I don’t know, but very convincing. " "I remember this fight on tv on Saturday afternoon when I was a little girl and being worried that my dad was injured. He didn’t need any hospital treatment. My mum told me he was fine and I think a lot of it was down to putting on a good show. He did say to me 'You can’t kid a kidder,' which makes me think it was great showmanship! " Francis combined his wrestling commitments with those of running a shop in Top Lock, Wigan. Shop work was in his blood as he had since childhood helped his parents in their shop in Park View, Ince, Wigan. 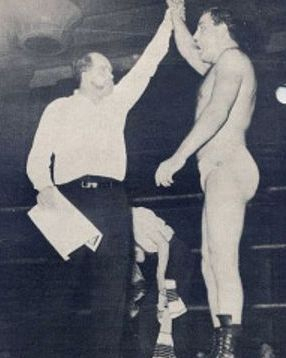 Francis Sullivan continued as one of Britain's top mat men until his retirement in 1966. He continued his business interests in a successful fruit machine business. His good friendship with Ernie Riley remained strong throughout their lives, the two men meeting up every Friday. Francis Sullivan died peacefully in hospital, on 6th June, 2009, three years after his wife Bessie. He was eighty-four years old.old. With thanks to Francis Sullivan's daughter, Karen, for her help in preparing this tribute.